A rain shower when you've just broken your seeded opponent and are about to serve for the match is generally not ideal. But Jessica Anzo didn't let the brief delay interfere with her focus, returning to hold serve at 7-5, 5-2 to oust No. 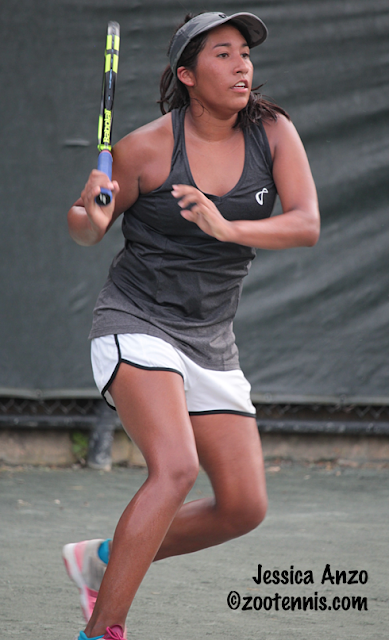 5 seed Abigail Chiu in the second round of the USTA Girls 18s Clay Courts. "I had to focus on my serve," said the 16-year-old from Temecula, California, who finished off the final game with an ace at 40-15. "I just had to remember what I was taught on my serve and calm down. I had to pretend like my coach was telling me exactly what to do, in my head, so I could remember it." Anzo, who is coached by former WTA Top 30 player Patricia Tarabini, doesn't get much of an opportunity to play on clay in Southern California, but she did spend a week on the surface before arriving in Memphis. "I took a week to play on it, practice sets and matches, in San Diego, Rancho Santa Fe," said Anzo, who makes the 45-minute drive south to train with Tarabini. "But these courts are way better than California." Anzo played her first match on Sunday, while Chiu, as a seed, received a bye. "It helped playing yesterday," Anzo said. "I got used to the clay, what the ball would be like, slower, faster. You know how you get, you get really nervous, and I was trying to get away from that." Anzo got a late break and hold to take the first set from Chiu and started the second set with a break, but that was the first of five consecutive breaks of serve. Anzo finally consolidated her third break of Chiu, holding at love for a 40-0 lead, and as the rain drops began to dot the Har-Tru, broke Chiu again for a 5-2 lead. "It kind of frustrated me," Anzo said of all the breaks to start the second set. "But I was all right, I've got to get this game. But I finally held the last two games." Anzo used the drop shot effectively against Chiu and although their last match was a "long time ago," according to Anzo, she had another tactic to employ. "I had to move her around and kind of wear her down," said Anzo, who looked energetic despite temperatures in the mid-90s and a heat index of over 100 degrees. "Then take the opportunity for the approach shot, make the right decision. She wore down, so my plan worked." The top four seeds, all of whom played at the Racquet Club of Memphis, the main tournament site, surrendered a total of just five games in their four victories. Top seed Janice Shin kicked off the morning with a 6-0, 6-2 win over Maria Santilli and No. 2 seed Samantha Martinelli followed with a 6-0, 6-1 victory over Zoe Klass-Warch. No. 3 seed Meibel Chi won the last ten games of the match in her 6-2, 6-0 win over Gabriela Armas, and No. 4 seed Ann Li blanked Courtney Kowalsky 6-0, 6-0. Although six No. 17 seeds fell, the only other seed in the top 16 to go out in her first match was Caroline Dunleavy, a No. 9 seed, who was beaten by Chiara Lommer 6-1, 6-0. Aside from Chi, Lommer has the highest ITF junior ranking of anyone in the field--116. The third round of doubles was played this evening, with the top seeded teams of Lexi Milunovich and Anna Rogers and Elysia Bolton and Chiu advancing to the round of 16 in straight sets. At the USTA Boys 16s Clay Court Championships in Delray Beach, No. 1 seed Carson Haskins and No. 2 seed Kevin Zhu both lost in their first matches in the second round. Haskins, the Easter Bowl champion, lost to Nicklas Oberg 6-3, 4-6, 7-6, and Zhu, who finished third at the Easter Bowl, lost to Noah Dufort 6-3, 3-6, 6-3. It is always interesting to see what players are getting better and those that are not. Its great to see Francesca DiLorenzo have a great Summer, same with a few of the other college girls so far but in the opposite direction for Florida's Brooke Austin. I hope she can turn it around but looks like she hasn't improved at all at Florida. Noah Rubin loses 6-3 6-2 to Lloyd Glasspool first round at the Binghamton Challenger. There is an article in Washington Post about Taylor Fritz. I had no idea he got married at 18. He is upset about people calling him a kid, because he is an adult. Certainly has shown more potential than other US teens so far, but so disappointed in this kind of attitude. I've noticed that whenever Noah Rubin loses, NEWSFLASH posts about his loss (of course when Rubin wins, we hear nothing). I'm not sure what this person has against Rubin, but it's important to note that Rubin has been off the court due to injury for almost eight weeks.